YOU CAN IMPROVE SO MUCH. The first point. Secondly, horses learn by association. Thirdly. In the fourth place. The fifth point. The following point (sixth). Point number seven. The eighth point. The ninth point. Lastly. Two types of suppleness. Exercises to supple a horse. Further reading. Figure 8. Serpentines. Leg yield. Effect of the seat. Developing the desired outline. Steps to supple your horse and round him up. Advantages. Preparing for the shoulder-in. Aids for shoulder-in. Beginning the shoulder-in. Mistakes to avoid. General mistakes. Benefits. Aids for the leg-yield. Leg-yielding to the right. Additional exercises. Where to apply it. Executing the half-halt. The half-halt in practice. Bear in mind. The correct rein back. The aids for rein back. Preparation. Lunging. Benefits of lunging and the sitting trot. 5 Balancing exercises. Purposes of lunging. Getting your horse to move off. Controlling the pace. Respect and disrespect. Lunging with bridle, side reins, surcingle or saddle. The most crucial of all building blocks. Responding to aids. Contact. Long and low. Half-halt for the green horse. Transitions. Medium pace. Correct rhythm. The purpose and influence of the Piaffe. Qualities of the ideal Piaffe. Preparation for the Piaffe. Aids for the Piaffe. Teaching the Piaffe – different ways of teaching the Piaffe. Improving the Piaffe. A calm and regular Piaffe. Straightening the horse. Piaffe anywhere in the arena. Piaffe in the right posture. Piaffe with more collection. A more brilliant Piaffe. Piaffe Pirouette. Transition from Piaffe to Passage. Sound advice. Enhancing the engagement of the hind quarters, and height of hind and front legs. The relationship between Piaffe and Passage. The ideal Pirouette. The aids for the Pirouette. Teaching the Pirouette. The walk Pirouette. The canter Pirouette from the walk. To teach the Pirouette starting from the canter. Sound advice. Between jumps. Riding position between fences. Position over fences. Diagrams and photos to illustrate correct position. First problem: Horse refuses to jump, jumps hesitantly, or stops before the fence. Problem 2: The horse hesitates or slows down as it approaches the fence. Problem 3: Rushing towards and over the jump. Problem 4: The horse runs away after the jump. Problem 5: Over excited and over fresh. Problem 6: The horse leans on the bit, resists the aids and rushes the fence. Problem 7: The horse approaches the fence in a crooked line. Problem 8: The horse jumps from a corner instead of straight through the middle of the fence. Problem 9: The horse is tensed up and is hollowing over the jump. Problem 10: The horse is careless and constantly hits the poles. Session 1. Session 2. Session 3. Session 4. Session 5. Making the jump higher. Head. Neck. Shoulder. Chest and rump. Back and loin. Croup and hind quarters. Hind legs. Front legs. Hooves. Coat. Mane and tail. Expression. Movement. General appearance. Breeding for halter classes. Making a selection. Step 1: Join up. Getting the halter on. Desensitizing. Moving and positioning the colt. Positioning and being led. Haltering and commencing show training. Feeding. Training. Finishing off. Shoeing the weanling. At the show. Parasite control and conditioning. Loading. After the weanling shows. Shoeing. Training. First stage of conditioning and training. Serious training. Fine tuning. General advice. Showing. 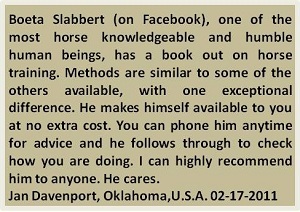 By C.J.du Plessis, breeder, trainer and exhibitor of numerous S.A.Champion Saddlebred in hand classes. Many times judge of South African National Saddlebred Championships. Starting point. The basic procedure. Temperament. Gaits, action and stamina. Height. Head. Neck. Shoulder. Back. Barrel. Fore legs. Pasterns. Hindquarters. Tail. The importance of setting in Three and Five Gaited Saddlers. Starting point. The psychology of horse training. Train for halter classes with the future in mind. Building respect. The horse which runs into a corner if you want to catch him. Videos, books and clinics. The approach to training principles. Procedure for Single Rein Stop (SRS).Advantages of disengaging the hindquarters. Slow hands. Backing. Spooking – its causes and remedy. Spooking – an overlooked jewel in solving the problem. The pessoa – one of the least known, but one of the most valuable pieces of equipment in a horse’s development in preparation for training. Tips for teaching a horse to rack. Racking tie ropes. Exercise and muscle building. Developing form in a show horse. Grooming and trimming. Feeding and conditioning. Minerals and vitamins. The neck sweat blanket. Historical background. The sport today. Tentpegging in South Africa.